Trison International Inc. is in to metal scrap bussiness exporting metal scrap to various countries as on demand, requirements and provides metal scrap at the best market price with quality assurance. Trison International Inc is involved in exporting metal scrap acquired from industries. We also undertake demolition jobs. At Trison International, Inc., we emphasize on ethics, safety and work as a family. Our employees are more than managers, supervisors or workers, they are members of a team and a family together. 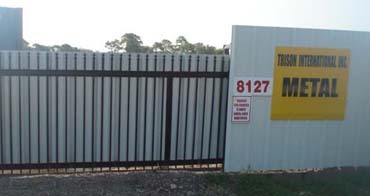 We are located at the prime location in the Houston area near the port of Houston. We regularly supply metal scrap mainly to India and various other countries. Integrity and competitive strength are the integral part of Trison’s business success. © - 2008 Trison International Inc. all rights reserved.